Jacques Tati, the legendary French comic, has always been a paradox. Many people find the antics of his famous creation, Monsieur Hulot, to be side-splittingly funny, but there are others, such as Yours Truly, who have never warmed to Tati’s brand of humour. The typical Tati gag will have M. Hulot opening and closing a series of doors, elaborately locking each one. When he has finished he pats his pocket and realises he has forgotten something. This necessitates the unlocking and relocking of every single door. Any gadget or contraption is an invitation for M. Hulot to wreak a kind of methodical havoc. Part of the audience will be laughing while others are digging their fingernails into the fabric of their chairs. Hulot’s first appearance, with long legs, funny little hat, pipe and raincoat, is enough to set his fans chuckling in anticipation, although I’ve always felt a sense of dire foreboding. The character was a key inspiration for Mr. Bean, but by any reckoning, Rowan Atkinson’s is a much darker comic sensibility. The Illusionist is based on a Jacques Tati script that remained unfilmed at the time of his death in 1982. For two decades it was in the possession of Tati’s daughter, Sophie, who died in 2001. 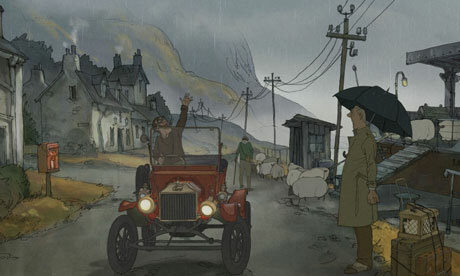 In 2006 the script was ultimately passed on to animator, Sylvain Chomet, who had scored a massive international success with his 2003 feature, The Triplets of Belleville. The film has been controversial, as it seems that Tati had an earlier daughter, Helga, who was abandoned when only a baby. It is unclear whether The Illusionist was an expression of remorse in regard to Helga, or born of a sense of guilt over spending so little time with Sophie. This issue has dogged the film’s appearance in Europe and the United States, although it’s unlikley to cause much friction in Australia. The protagonist is an aging music hall conjuror called Tatischeff, the real name of Jacques Tati. No prizes for guessing that Tatischeff is a dead ringer for Tati, and by implication, Monsieur Hulot. At the end of the 1950s Tatischeff’s act is old hat. He performs in shabby theatres to tiny audiences, while a younger generation discovers the joys of rock and roll. His search for work takes Tatischeff to London, then to Scotland, where a friendly, drunken Scotsman gives him a gig in a tiny island village. He befriends Alice, a young domestic working at the inn where he stays and performs. When he leaves the island she tags along, a true believer in his magical powers. In Edinburgh, Tatischeff finds work at a ramshackle music hall, and the couple settle down in a hotel populated by vaudeville folk. To keep Alice happy, Tatischeff buys her clothes and shoes that he can ill afford; even taking a night-time job in a garage, where he gets up to some Hulot-esque mischief. The word “bittersweet” might have been coined especially for this film. It is bittersweet and sentimental from beginning to end. There is very little dialogue apart from a few dim mutterings. Nothing is more impressive than Chomet’s elaborate watercolour-like animations, which bring to life the sad, seedy aspects of life in post-war Paris, London and Edinburgh. His exteriors are so well observed that I could remember walking along some of the very same streets. His figures are so fluent that one hesitates to call them cartoons. The relationship between the kind, fatherly magician and his young Scottish acolyte is amazingly innocent. This is so foreign to the paranoia of the present-day in which every encounter between adults and children suggests an unhealthy sexual interest, that many will find Tati’s vision refreshing. Others may see it merely cloying. In art as in life, too much niceness induces a queasy feeling. The Illusionist has been rapturously received by overseas reviewers, taken off-guard by its melancholy, gormless charm. The inexplicable appeal of Jacques Tati has played its part, along with happy memories of Chomet’s previous film. It’s a good combination on paper, but in practice it has produced a movie that is lighter than air. This is, of course, deliberate. The aging illusionist inhabits a world that is itself hardly more than an illusion. He clings to his vanishing art like a security blanket, insulating himself from the changes in everyday life. Alice is the only person who seems to sincerely believe in him and he strives mightily to sustain that belief. Tatischeff’s hopeless attempt to keep the real world at bay is also intended to touch viewers’ hearts. At the end of The Illusionist I thought about the way Dickens’s description of little Nell’s last moments drew copious tears from eminent Victorians such as Carlyle, Hood, Landor and FitzGerald, while Oscar Wilde would famously quip: “One must have a heart of stone to read the death of little Nell without laughing.” Although I never laughed, this charming film left me feeling very stony. France/UK. Rated PG, 80 minutes.